تاران, فرشید, نورآبادی, سعید. (1395). بررسی آزمایشگاهی و شبیه‌سازی تأثیر ترتیب قرارگیری لایه‌های خاک و ضخامت آن‌ها در انتقال محلول. نشریه آبیاری و زهکشی ایران, 10(1), 63-72. 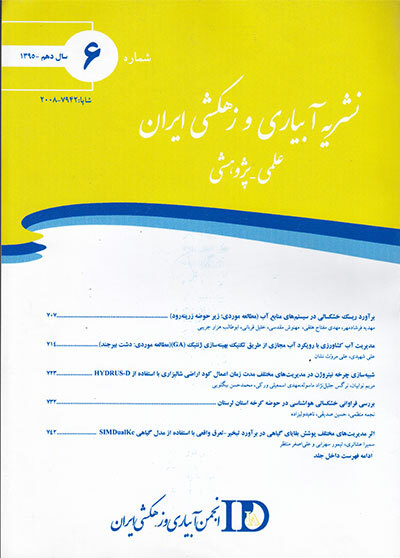 فرشید تاران; سعید نورآبادی. "بررسی آزمایشگاهی و شبیه‌سازی تأثیر ترتیب قرارگیری لایه‌های خاک و ضخامت آن‌ها در انتقال محلول". نشریه آبیاری و زهکشی ایران, 10, 1, 1395, 63-72. تاران, فرشید, نورآبادی, سعید. (1395). 'بررسی آزمایشگاهی و شبیه‌سازی تأثیر ترتیب قرارگیری لایه‌های خاک و ضخامت آن‌ها در انتقال محلول', نشریه آبیاری و زهکشی ایران, 10(1), pp. 63-72. تاران, فرشید, نورآبادی, سعید. بررسی آزمایشگاهی و شبیه‌سازی تأثیر ترتیب قرارگیری لایه‌های خاک و ضخامت آن‌ها در انتقال محلول. نشریه آبیاری و زهکشی ایران, 1395; 10(1): 63-72. درک انتقال محلول در خاک­های ناهمگن و لایه­ای جهت مدیریت بهتر و توصیف حرکت مواد شیمیایی در این گونه محیط­ها حائز اهمیت است. در این مطالعه تأثیر ترتیب قرارگیری لایه­های خاک با ضخامت­های مختلف در حرکت محلول بررسی شد. بدین منظور از دو خاک با بافت­های مختلف شن لومی و لوم رسی برای تهیه شش ستون دو لایه­ای (دو ستون 10 سانتی­متری، دو ستون 20 سانتی­متری و دو ستون 30 سانتی­متری) استفاده و انتقال محلول سدیم کلرید در این ستون­ها آزمایش شد. با قرار گرفتن لایه­ شن لومی در زیر لایه لوم رسی (حالت اول)، در مقایسه با حالتی که ترتیب قرارگیری این دو لایه تغییر داده شد (حالت دوم)، رخنه محلول و مشاهده غلظت اوج در کف ستون سریع­تر و دنباله منحنی رخنه کوتاه­تر بود. با افزایش ضخامت لایه­ها، این تفاوت­ها بیش­تر شد. به طوری که در لایه­های 5 سانتی­متری با تغییر محل دو لایه، اختلاف بین زمان رسیدن محلول رخنه شده به یک غلظت تقریباً ثابت، زمان مشاهده غلظت اوج و مدت زمان امتداد دنباله منحنی رخنه به ترتیب 100، 130 و 30 دقیقه بود. این زمان­ها در لایه­های 10 سانتی­متری به ترتیب 150، 190 و 40 دقیقه و در لایه­های 15 سانتی­متری به ترتیب 210، 250 و 40 دقیقه بودند. ترتیب قرارگیری لایه­ها بیش­تر از طول ستون بر انتقال محلول تأثیر گذاشت. به­طوری که غلظت اوج در حالت دوم ستون 10 سانتی­متری 40 دقیقه دیرتر از حالت اول ستون 20 سانتی­متری و در حالت دوم ستون 20 سانتی­متری 100 دقیقه دیرتر از حالت اول ستون 30 سانتی­متری رخ داد. انتقال محلول به روش اجزای محدود و با استفاده از مدل GeoStudio شبیه­سازی شد. نتایج شبیه­سازی با ضریب تبیین (R2) بیش­تر از 984/0 و جذر میانگین مربعات خطا (RMSE) کم­تر از 530/0 گرم بر لیتر رضایت بخش بود. In heterogeneous and layered soils, in order to a better management and description of chemicals movement on such media, perception of solute movement is very important. In this study, the effect of soil layers arrangement with different thicknesses on solute movement was investigated. For this purpose, two soils with different textures (i.e. loamy sand and clay loam) were used to prepare six two-layered columns (two 10cm-columns, two 20cm-columns and two 30cm-columns), and the movement of sodium chloride in these columns was tested. First arrangement, namely the loamy sand layer was beneath the clay loam layer, was compared to second arrangement (the layers were swapped), and it was observed that the solute breakthrough and the appearance of peak concentration in the bottom of column were faster and the tail of breakthrough curve was shorter. By increasing the thickness of layers, the differences also increased, so that by swapping the two layers in 5 cm-layers, the difference between the times that breakthrough solute reaches to an almost constant concentration, the time of maximum concentration appearance and the duration of breakthrough curve tail time were 210, 250 and 40 minutes, respectively. Layers arrangement more than column length effected the solute movement, so that the peak concentration in second arrangement of 10cm-column was 40 min later than the first arrangement of 20cm-column and, the concentration in second arrangement of 20cm-column was 100 min later than the first arrangement of 30cm-column. The solute movement was simulated by finite element method using the GeoStudio model. The simulation results have coefficient of determination (R2) more than 0.984 and root mean square error (RMSE) less than 0.530 g/L. This means that the simulation results were satisfactory. Abbaspour, K.C, Kohler,A., Simunek,J., Fritsch,M and Schulin,R. 2001. Application of a two-dimensional model to simulate flow and transport in a macroporous agricultural field with tile drains. European Journal of Soil Science 52.3: 433–447. Butters,G.L., Jury,W.A and Ernst,F.F. 1989. Field scale transport of bromide in an unsaturated soil: 1. Experimental methodology and results. Water Resources Research 25.7: 1575-1581. Charbeneau,R.J. 2000. Ground water hydraulics and pollutant transport, Upper Saddle River, NJ, Prentice Hall. Hanson,B.R., Simunek,J and Hopmans,J.W. 2006. Evaluation of urea-ammonium-nitrate fertigation with drip irrigation using numerical modeling. Agricultural Water Management 86.1-2: 102–113. Hillel,D. 2004. Introduction to Environmental Soil physics. Elsevier Academic press. Hooshmandfar,A and Khodadadi,A. 2014. Using GeoStudio model for assessment of leachate migration through soil in Hushangabad-Azizabad landfill of Tehran. Journal of Middle East Applied Science and Technology 3.8: 371-374. Huang,K., Toride,V and van Genuchten,M.Th. 1995. Experimental investigation of solute transport in large, homogeneous and heterogeneous, saturated soil columns. Transport in Porous Media 18.3: 283-302. Hulagabali,A.M., Solanki,C.H and Dodagoudar,G.R. 2014. Contaminant transport modeling through saturated porous media using finite difference and finite element methods. Journal of Mechanical and Civil Engineering 11.1: 29-33. Jury,W and Utermann,J. 1992. Solute transport through layered soil profiles: zero and perfect travel time correlation models. Transport in Porous Media 8.3: 277-297. Legates,D.R and Mc Cabe,G.J. 1999. Evaluating the use of "goodness–of–fit" measures in hydrologic and hydroclimatic validation. Water Resources Research 35.1: 233-241. Leij,F.J and van Genuchten,M.Th. 1995. Approximate analytical solutions for solute transport in two-layer porous media. Transport in Porous Media 18.1: 65-85. Leij,F.J., Dane,J.H and van Genuchten,M.Th. 1991. Mathematical Analysis of One-Dimensional Solute Transport in a Layered Soil Profile. Soil Science Society of America Journal 55.4: 944-953. Mohammadzadeh-Habili,J and Heidarpour,M. 2015. Application of the Green–Ampt model for infiltration into layered soils. Journal of Hydrology 527: 824–832. Porro,I., Wierenga,P.J and Hills,R.G. 1993. SoluteTransport ThroughLarge Uniform and Layered Soil Columns. Water Resources Research 29.4: 1321-1330. Sharma,P.K., Sawant1,V.A., Shukla,S.K and Khan,Z. 2014. Experimental and numerical simulation of contaminant transport through layered soil. International Journal of Geotechnical Engineering 8.4: 345-351. Siyal,A.A., van Genuchten,M.Th and Skaggs,T.H. 2013. Solute transport in a loamy soil under subsurface porous clay pipe irrigation. Agricultural Water Management 121: 73–80. Toride,N., Leij,F.j and van Genuchten,M.Th. 1999. The CXTFIT code for Estimating Transport Parameters from Laboratory or Field Tracer Experiments. Version 2.1, Research Rep. 137. U.S. Salinity Lab, Riverside, CA, USA. Zhou,L. 2002. Solute transport in layered and heterogeneous soils. Dissertation of Doctor of Philosophy, Department of Agronomy, Tsinghua University of Chinese.